Getty Images / Frederick M. BrownDrew Carey became the host of ‘The Price Is Right’ in 2007. 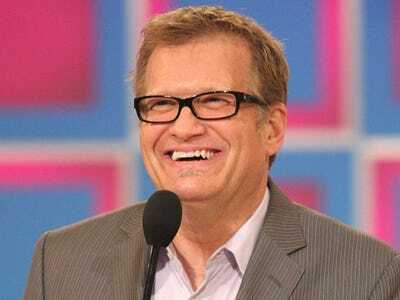 “The Price Is Right” host Drew Carey uses vision boards to set personal goals every day. A vision board is a visual representation of personal goals. Carey said if you don’t set goals for yourself regularly, you can be vulnerable to doing things that other people want you to do. Before Drew Carey shows up to the “The Price is Right” set every day, the host sets personal goals for himself, he said in a recent interview with INSIDER. The first episode of “The Price Is Right” aired September 4, 1972 with host Bob Barker. In 2007, Carey took over for Barker as the daily show’s host. Before his hosting gig, Carey acted in TV shows and movies and performed improv comedy. Forbes reported Carey was one of the highest-paid TV show hosts in 2016, earning $US12.5 million. When INSIDER asked Carey his best career advice, he said there’s something he does that he also encourages his audiences to do: create a vision board and set daily personal goals. This simple habit can help you identify your own definitions of happiness and success, he said. “I always say that that kind of thing is important to make your own goals whether its a vision board or not because otherwise someone will make your goals for you,” Carey said. “If you don’t have any goals, you walk down the street and it’s like ‘buy this burger, get this car, watch this movie, spend your time doing this,’ and they try to draw you into spending your minutes that you only have a precious few, just like everyone else,” Carey said. Entrepreneur and bestselling author Joyce Schwarz spoke to Business Insider’s Kim Renfro about vision boards and defined it as a visual map someone creates to design the best possible future and see beyond what one would think is possible. If you don’t set personal goals every day – whether you put all of them on your vision board or not – you can fall victim to advertisements or pressure from peers, Carey said.